Viruses and malware can create stress, especially in the business world where downtime equals loss of profits. It is very important to stay informed of all the latest threats in order to protect your data and with technology advancing at a rapid pace, malware programmers are finding different ways to sneak past network security features. This week’s threat is the perfect example of this. This new Trojan virus sneaks into your PC undetected and remains invisible. Not all viruses and malware enter your network through the internet, you must always make sure your physical computer location is safe and secure. In other words you need to make sure no one with bad intentions has physical access to your computer. USB Thief is a newly discovered USB born threat that has the ability to steal large quantities of data by infecting the targeted host and staying undetected. Once the attacker has access to the targeted PC they insert the malicious USB stick. Next the virus attaches itself to the desired drive, by this time the computer is infected without its antivirus software detecting the infection. Multi-stage encryption features help camouflage the Trojan while it steals your important business data. This self-disguising capability can be used in all malicious attacks, not just the USB Thief. USB Thief works in 4 stages consisting of three stages of loaders followed by the payload stage. The first stage loader tricks the user into running the malicious program, the second stage loader preps the computer for the third stage, the third stage loader actually executes the malware, and the payload stage is when the data is stolen. 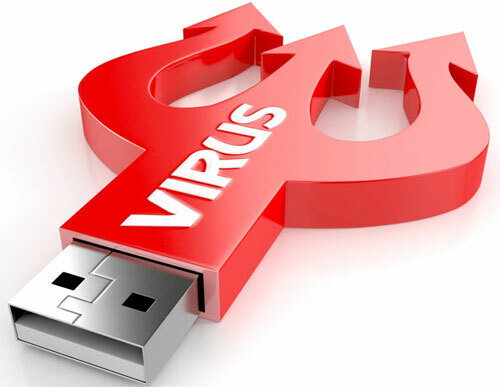 This virus is very advanced and can cause significant damage to a business. One famous attack of this nature was carried out in 2014 on Iran’s nuclear program. Someone from the inside crippled their network infrastructure with the Stuxnet virus. The attack was initiated through a USB drive and spread across the targeted network. The access it was able to gain was known for reportedly destroying roughly a fifth of Iran’s nuclear centrifuges by causing them to spin out of control. With more and more advanced attacks like these it’s ever more important to make sure your network security is top priority and with the biggest security threat being your end users training and awareness are of the upmost importance. Contact Integrated Computer Services as soon as possible to see how we can help you improve your company’s network security and better train your end users to prevent these types of security breaches.